Lots of heartwarming stories (not nearly enough) for displaced families but I hardly read a thing about single persons with similar issues. Not tear jerky enough I suppose. My frustration with the governments promise to help has made me a bit caustic, jaded. Anybody out there looking to help a blue collar girl stuck trying to make a go of it in Baltimore? Looking for feedback,I have just started the sweat equity piece of getting my habitat house,I am trying to hear from other habitat home owners. Question In the program you are in does habitat retain ownership of 50% of the equity in your home forever,It is what they do here in AZ,It makes owning your home almost impossible ? I feel that the show I watched yesterday was a huge disappointment. I'm sure most of the fixtures and materials were donated to be part of Oprah's project but since she has so much why does she give so little of her own wealth. THe houses were all built with the same face and layout as project homes would be built. TH decor was terrible and the childrens room were drab and unimaginitive. Budget aside, the rooms lacked personality which do not take a huge budget to create. Also the advertisement for trips to Chicago was aired following the show which I found tacky to say the least. After the big "suprise" of a project homes which were drab with tiny rooms this was like a slap in the face to the victims. I would like to Oprah build something with her own resources that she would actually stay in herself. I kinda felt the same way. Kind thoughts, but it was a bit of a publicity parade. maybe I'm being too harsh..dunno. I am one of the first twelve families that bought one of the homes on Angel Lane in Houston. It is both interesting and annoying to read your comments. Given what television and media is about there is a bit of truth in what Peter states about branding and the publicity parade. Frankly, it is what motivated many people to give to ALL charitable causes in the wake of Katrina and other disasters like the tsunamis. True there are some that give quietly--but when you have tens of thousands of people in dire need--does it matter? When the last family moved in they did have food in pantry--but there were no parade of cameras. You must understand that there were forty other families living here by the time they moved in. We were and are trying to get back to "normal" and get our children back on track. We needed the hype to die down and thankfully to some extent it has. 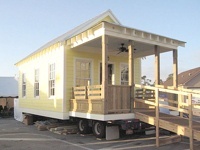 In hindsight, I think that the Katrina cottages would be a much better alternative for those families that remain in FEMA trailers in the LA and Gulfport areas. Once you actually are in those trailers you see how much poverty Kat has caused. To the people who want Oprah to build something she would actually stay in--lol..she did spend a couple of nights in the houses. 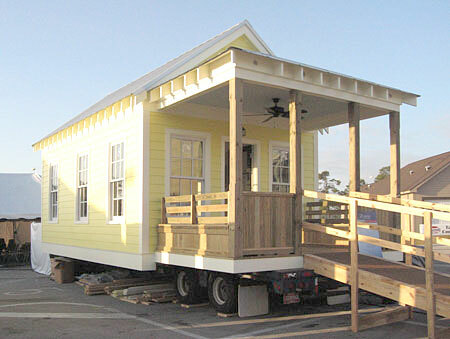 When she came on site she was provided the typical celebrity trailer and she hated it. So she stayed in a house. Publicity? Maybe. I am thankful for the roof over my head, but I can say that the "process" of getting here was NOT easy. We were "expected" to be at the publicity's beckoned call. We were "expected" to share details of "heartwrenching" stories. For some, it was intrusive and undignified to some extent as people had experienced deaths of loved ones. There were many of us who found ourselves in media stories that twisted what we had originally said and changed the spin of the story from what they had been told the story would be when it was released (NOT by Oprah's people--this was done by other media resources). We are all grateful to Ms. Winfrey and the many people who donated time and money for starting the process--but the public needs to understand that we, the families, were NOT GIVEN these homes. We PAID CLOSING COSTS, we PAY mortgages and property taxes every month. We are also still in a recovery process as this neighborhood goes through growing pains trying to build it's own identity. Contrary to popular belief, we DO NOT consider ourselves Oprah's Angel Lane. She's a great lady who obviously believes in giving back, but the street was called Asheburton Spring Drive for months after we moved in and then it was changed. We do NOT all know each other as we all come from different places. There are white and latino families in our neighborhood--not just black. There is so much misinformation about our neighborhood out there. I hope this will clear up some of it. As for the selection process, we all applied via the routine Habitat for Humanity process. We had to provide income tax transcripts for the last three years, birth certificates, social security cards, had to be employed, provide bank statements, provide paystubs every pay period up until closing time. Had to provide and pay closing costs, we had to submit to background checks, provide FEMA info, and credit reports were conducted on us. I think this part is called a typical homebuying scenario. But we also had to work 300 hours building our own homes, landscaping, etc.--this part not so typical. Habitat here does NOT retain 50% ownership in homes. There is an initial period that you must live in the home before you can sell it--this is to prevent people from scamming or profiting by "flipping" homes. But after that initial period--you are free to do what you want. For the lady that was wondering about single persons with "similar problems". We got them. There are many single people (with children) in our neighborhood as well as traditional type families. If you want to know more...visit our community website--yeah, we started one (www.angel-lane.us). Contrary to popular belief, we are not uneducated--we have among us schoolteachers, computer science professionals, nurses, law enforcement, stay at home moms, stay at home dads, artists, and retired folks. In other words, typical hardworking, apple-pie (okay, maybe more like sweet potato pie) Americana--not refugees or evacuees--Americans! Angel Network is basically a tax shelter for OPRAH. No different then the GATES foundation. Anybody out there looking to help a blue collar girl stuck trying to make a go of it in Baltimore? I love Oprah's show, especially the Big Give. Do you like take a travel or go shopping, if you like why didn’t you bought a new bag or wallet? That will attract people attention and make you fashion! You know what charm is : A way of getting the answer "yes" without having asked any clear question. Please, can you PM me and tell me few more thinks about this, I am really fan of your blog...gets solved properly asap. I am sure people were selected based on "other" needs. Perhaps due to connections?